Chino Point, located a few miles west of Seligman, Arizona, is a rocky outcropping overlooking the Aubrey Valley and accessible via a rather precarious dirt road. 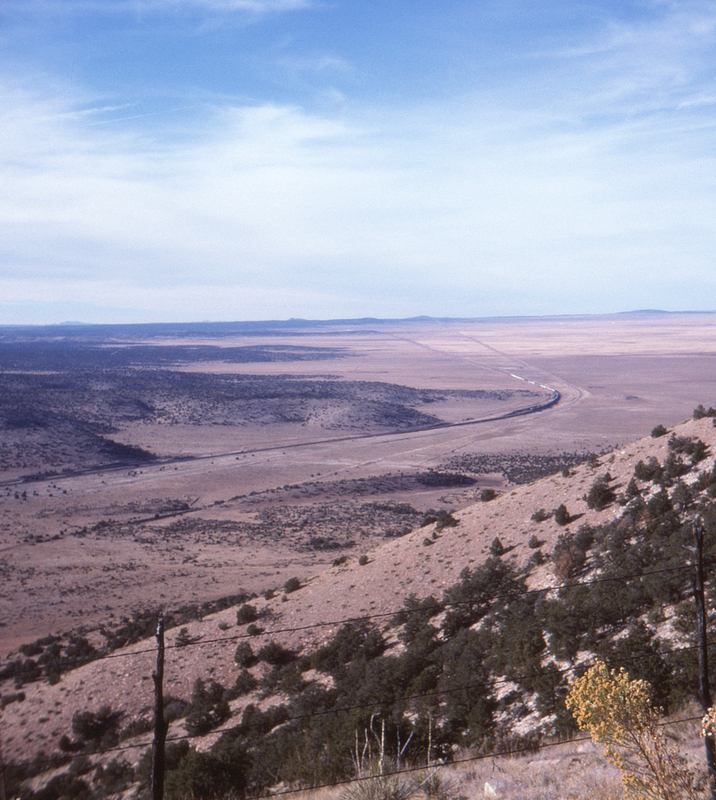 It provides a spectacular view both east and west; here, looking west, we see the Santa Fe mainline with an eastbound freight proceeding across the valley. Further off in this direction is Yampai Summit (the mountains in the far distance) followed by Kingman, Needles and California. Old Route 66 (now Arizona State Route 66) is visible to the right of the tracks. By this time the Santa Fe has merged with Burlington Northern to create the Burlington Northern Santa Fe. This page posted 8/1/2018. Text and photo ©2018 Lamont Downs.